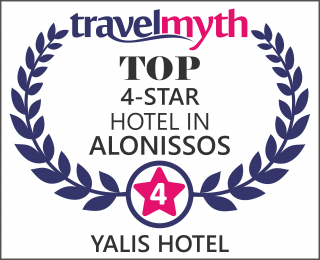 When you visit the island of Alonnisos your steps will lead you through the scenic Votsi – by the sea and over looking the deep blue- is located the Yalis hotel. The complex with the unique architecture of a small village is inviting you for a stroll in the wonderful surroundings filling your senses with serenity, euphoria and positive energy. Yalis hotel, built on the south side of the island only 1,5 km from the port of Patitiri, against the deep blue of the sky and sea within a green area, consists of twenty rooms and suites, well-designed, offering high quality services. Our knowledge and experience, the excellent architecture, the detailed and particular taste, the idyllic location, our willingness for a perfect result, our love for hospitality along with accommodating, people who always welcome you with a smile, can guarantee you an unforgettable summer.